of letters to the editor every week in every paper across this state. personal stories of why Nebraskans are opposed to the death penalty. tuned for more information about how you can share your story. letters to the editor and/or becoming a County Captain. Could the Courts throw out the ballot initiative? behind the effort and thus the ballot initiative isn’t valid. Could we execute an innocent man in 2015? Richard Glossip is the Oklahoma death row inmate who was scheduled to be executed September 16th but received a last minute stay due to the many troubling questions in his case. Read this letter from a variety of community leaders explaining the troubling details of his case, including Barry Switzer, head football coach at the University of Oklahoma. Nebraskans for Alternatives to the Death Penalty (NADP) said the latest finance report filed with the Nebraska Accountability and Disclosure Commission on behalf of those who are seeking a return of the death penalty shows that Nebraskans have other priorities. In the latest filing, Nebraskans for the Death Penalty spent $903, 000 to put the death penalty on the ballot in November 2016. “Frankly, I’m stunned that they would spend so extravagantly just to collect signatures. Nebraskans are more concerned with a fair tax rate, fixing roads and affordable healthcare than they are with the effort to bring back the death penalty,” said Rev. 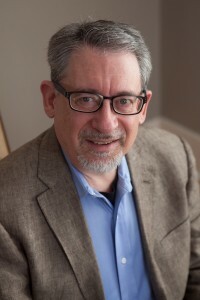 Stephen Griffith, Executive Director of NADP. During the next 14 months NADP will continue doing what it has done for three decades; having conversations with Nebraskans about why capital punishment has failed our state. It won’t be official until the Secretary of State’s office confirms the signatures over the next 40 days, but it seems death penalty repeal will be on the November 2016 ballot. We are confident the more people learn about the death penalty the less likely they are to support it. Please stick with us through 2016 as we continue to spread the word about the realities of the death penalty. Nebraskans for Alternatives to the Death Penalty (NADP) is closely monitoring the initial results of the death penalty referendum signature gathering campaign, and will await the official decision from the Secretary of State’s office. However, today proponents of the death penalty are claiming to have enough signatures to suspend the legislature’s bi-partisan repeal of capital punishment in advance of the 2016 general election. Although the death penalty referendum appears to have obtained signatures from 10-percent of registered voters, it failed to attract broad-based financial support, with governor Ricketts, his father, and a handful of their associates providing the bulk of funds. “It is evident that grassroots Nebraskans have already rejected the death penalty with their pocketbooks,” Griffith said. 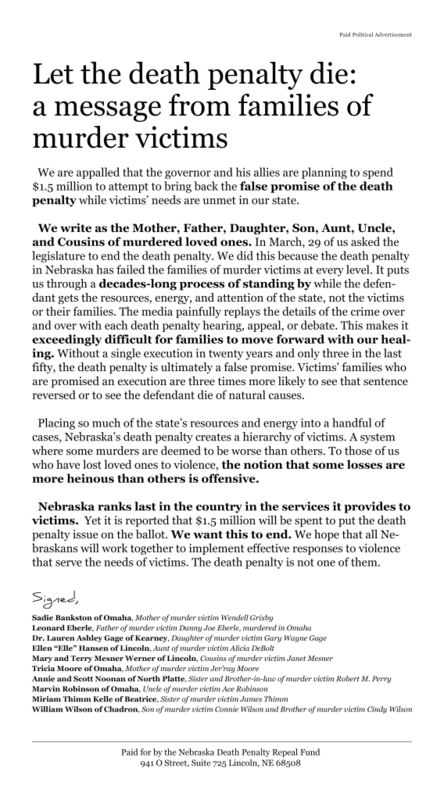 During the next 14 months NADP and their project, Nebraska Conservatives Concerned About the Death Penalty (CCATDP), will continue doing what it has done for three decades; having conversations with Nebraskans across the political spectrum about why capital punishment has failed our state. The undeniable and unfixable problems with capital punishment caused the Nebraska Legislature to vote overwhelmingly three times to repeal the death penalty and then override the governor’s veto. The Board of Nebraskans for Alternatives to the Death Penalty has announced that Rev. Stephen Griffith will become Executive Director of the organization. Rev. Griffith, a life-long Nebraskan, has served United Methodist congregations in Hardy, Bertrand, Loomis, Lexington, Osceola, Omaha, and Lincoln. His ministerial career concluded in June after 13 years serving Saint Paul United Methodist in downtown Lincoln. Nebraska’s death penalty is repealed! Vote board on the motion to override the Governor’s veto of death penalty repeal. We did it! After overcoming two filibusters and a veto, the Nebraska Unicameral voted 30-19 to repeal the death penalty. A tremendous thank you to the thousands of people who brought us to this moment after decades of hard work. Please take a moment to thank your Senator for their repeal support! Then follow-up with a handwritten thank you note for added effect. There is nothing more touching than a personal thank you. These 30 Senators deserve to hear congratulatory messages from their dedicated constituents!